Happiness is formally defined as: the quality or state of being happy; good fortune; pleasure; contentment; joy. But defining personal happiness is an individual perception. We all want to be happy, but defining it for ourselves is a challenge and obtaining it can be a greater problem. Personal growth involves looking into how you can become happier in your life. Martin Seligman, researcher and author of Authentic Happiness, describes happiness as having three parts: pleasure, engagement, and meaning. Pleasure is the “feel good” part of happiness. Engagement refers to living a “good life” of work, family, friends, and hobbies. Meaning refers to using our strengths to contribute to a larger purpose. He believes all three parts are important, but, engagement and meaning are the keys to a happy life. There is a difference between temporary or situational happiness and overall feeling of happiness in life. Ask yourself, “Do I have a happy life” or “Am I a happy person”? Personal growth is developing yourself to be a happy person and to see life as happy. How do you achieve a happy life? Being grateful for the positives that already exist in your life can help you to feel happiness. This can be friends, family, other people, a job, an experience, anything that you are grateful for. Make a list of everything you feel grateful for. Even if you have a partial gratitude, write it down. An example, even if you are not completely satisfied with your job, but are grateful you have a job, it should go on the list. Having a list can remind you of the existing positives in your life. As time goes on, keep adding new people or experiences to the list. Do the 3 things that have been told to you for years: Eat right, sleep right, and exercise. When you take care of yourself, you are more likely to feel an overall sense of happiness. These 3 simple things help you to stay physically balanced. It is recommended to get 7 to 8 hours of sleep every day. When you are well rested, your brain and body are ready to tackle any problems and enjoy any experiences. Eating right allows you to have all the necessary vitamins, minerals and nutrition that your body needs. Having physical health can bring you happiness in just knowing you are taking care of yourself. Research has demonstrated that when you are physically well, you tend to also have emotional balance. Having emotional balance means having a sense of happiness in your life. Putting a smile on your face can improve your mood. It is hard to have a negative outlook when you are smiling. When you smile you can create a new outlook and response to situations. You can also help others to feel happy. Smiles are contagious. When you smile at work or at a store, others may feel happier inside and return the smile or pass it on to others. 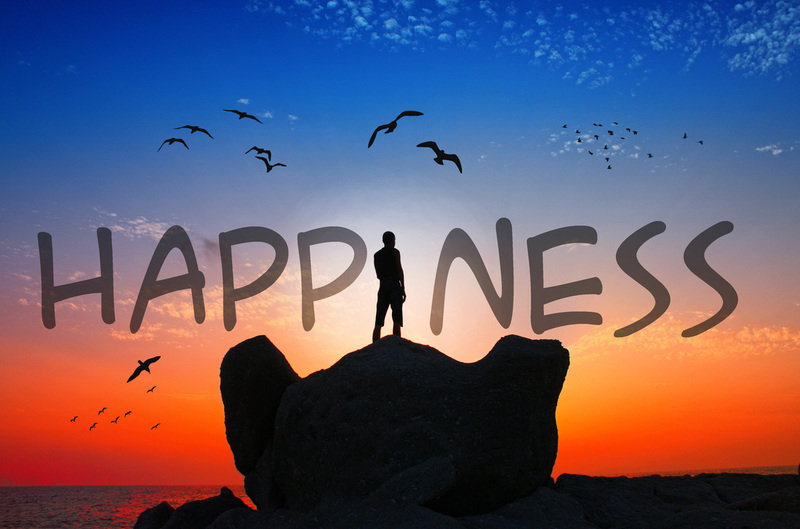 Obtaining happiness in your life is achievable. Personal growth takes time and commitment. Taking time and effort to take steps toward achieving happiness can be very rewarding. When you have happiness in your life, it makes even smaller stressors more manageable. It can also make you feel you have more fulfillment in your life.